Fred Singer, one of the greatest living scientists and a prominent climate skeptic has been ridiculed because he gave an opinion as a scientist that second-hand smoke was not harmful. For that his reputation has been slimed by the intellectual pygmies that infest the Global Warming underworld . They have used his connection to tobacco to discredit his global warming skepticism with Naomi Orestes calling him a "Liar for Hire" , a statement which now may have legal consequences. A definitive scientific study has found that Fred was completely correct about the link between second hand smoking and cancer. A large-scale study found no clear link between secondhand smoke and lung cancer, undercutting the premise of years of litigation including a Florida case that yielded a $350 million settlement. The article in the Journal of the National Cancer Institute details a study of 76,000 women over more than a decade, which found the usual link between smoking and cancer. Lung cancer was 13 times more common in current smokers, and four times more common in former smokers, than in non-smokers. The study found no statistically significant relationship between lung cancer and exposure to passive smoke, however. Fred Singer's bio is below. Dr Will Happer ,phycisist from Princeton University has prepared a Powerpoint presentation called The Myth of Carbon Pollution , the title of which is self-explanatory. The graph below shows the greening of the globe caused by increased CO2 , an average of 11% which applies to food crops across the world , a fact conveniently ignored by the scientific charlatans promoting the Global Warming scam. 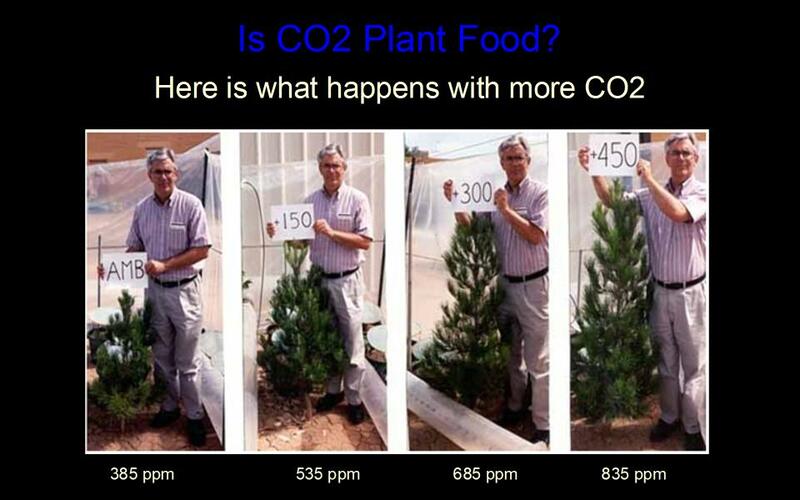 The increase in crop yields specifically caused by CO2 is feeding more than a billion people and the effect is shown dramatically in CO2 plant growth tests. 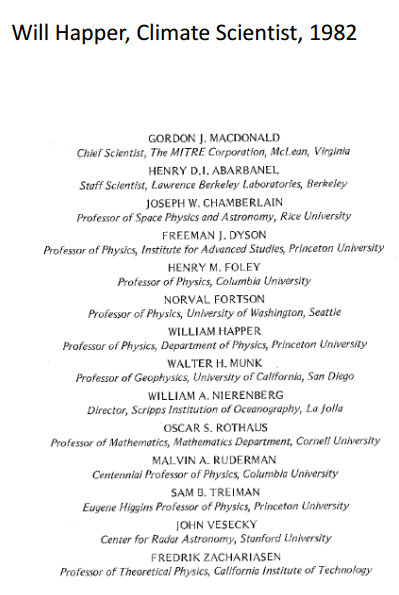 For those who think that these are just crack-pot ideas you only need to check the credentials of William Happer and his group listed below including Freeman Dyson recognised as Einstein's successor. Residents living near wind turbines will be heartened by the latest research published by the Royal Society showing low frequency noise causes hearing damage interfering with the normal ear function. The wind lobby and a largely compliant medical profession has continually downplayed and ignored innumerable complaints from distressed wind farm neighbors who now have real ammunition against these ugly birdmincers. Dangerous warming in the 1880's obviously caused by horse flatulence. 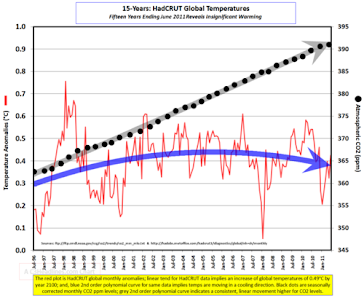 The Australian Bureau of Meteorology has been under sustained attack recently for blatantly cooking the temperature data books to achieve "unprecedented" warming due to an increase of CO2 in the atmosphere. But just as the declining arctic ice scam requires starting the record in 1979 when ice was at a very high level , the BOM has scrapped temperature records prior to 1900 to preserve the scam.. Climate experts now pretend that the Australian temperature record began in 1910. They do this to hide all of the record hot years before 1910. The BOM is a national disgrace and the so-called "unprecedented warming" has been created by unprecedented fiddling of the books! 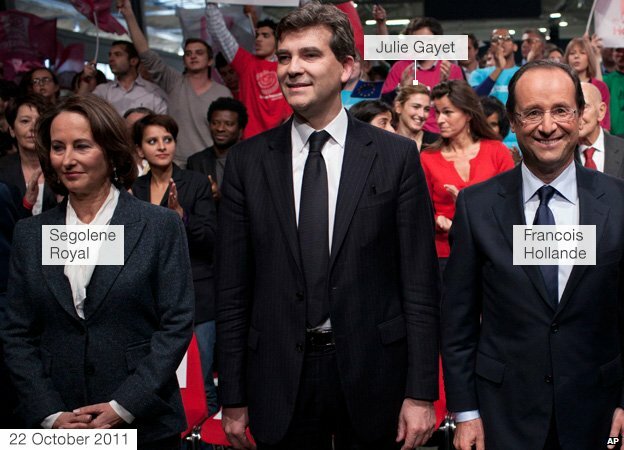 Francois Hollande , France's socialist president took some time off from his complicated love life to blow a billion dollars of his constituent's money with a pledge to the UN slush fund known as the Green Climate Fund. Finding a spare billion dollars when France's economy is in the toilet is no mean feat but obviously the money was not required for roads,schools or hospitals or other luxuries for the French peasantry . Meanwhile more responsible leaders from Australia and Canada had no trouble avoiding such grandiloquent gestures and sensibly kept their wallets firmly closed. Australia's Bureau of Meteorology is still under fire for tampering with the Australian temperature record turning cooling into warming with unjustified changes. BOM is being forced to set up an independent review board to audit procedures. An article Maurice Newman of the Australian sums it up. WEATHER bureaus are a protected species. Often criticised, their workings remain a mystery to most of us. They continue to ­escape close scrutiny. Perhaps a predisposition to man-made global warming accounts for the Met Office’s failure to predict abnormally harsh winters in Britain? After all, its chairman for two full terms was Robert Napier, a global warming activist and former head of WWF UK. The Met’s leaning came to light in leaked emails and revelations from Russian scientists. It and the Climatic Research Unit of the University of East Anglia were shown to have systematically contorted data past and present to achieve the desired warming dir­ection. The frustrated CRU climatologist-programmer, Ian “Harry” Harris, admitted to struggling with the complex computer programs and conceded he would do what the CRU usually did, “allow bad databases to pass ­unnoticed and good databases to become bad”. The leaked emails also informed us of Australia’s collusion in the warming hype. There was an email from Phil Jones referring to Australia “inventing” the Dec­ember 1995 monthly value, and there was reference to Australian scientists who “would like to see the section on variability and extreme events beefed up if possible”. The head of climate monitoring and prediction ser­vices at the Bureau of Meteorology boasted about a policy that “snows” sceptics. Doctoring data or throwing inquirers off the track to deliver an outcome is unscientific and unacceptable at any time. Yet in climate science there seems to be a culture of toleration. In 2009 John Theon, retired chief of NASA’s Climate Processes Research Program, testified to a US Senate inquiry that “scientists have manipulated the observed data to justify their model results”. Fast forward to today. This newspaper’s environment editor, Graham Lloyd, published information that raises questions about the quality of Australia’s temperature records. 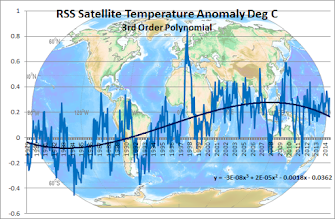 In a series of articles, Lloyd published details about the Bureau of Meteorology’s data “homogenisation”, the practice that involves the mixing, matching and deletion of temperature records and that seemed to create its own discontinuities. The bureau claims to observe world best practice. Perhaps. But homogenisation practices globally are under challenge, so conformity provides little comfort. If temperature manipulation can happen somewhere, why not elsewhere? In response to The Australian’s report, the BoM quietly released a “nothing to see here” summary of the impact of temperature adjustments at 112 locations around Australia with the list of reference stations used for comparison. The stated reasons for homogenisation seem arbitrary. Words like “merge”, “move” and “statistical”, provide little understanding of the thinking behind each decision or the reason stations were chosen. Colonial records are dismissed, notwithstanding the existence of Stevenson screens and the undoubted diligence of record keepers pre-1910. To the layman, the list of so-called “nearby” stations used to homogenise data raise questions of suitability. Is Bathurst jail really an appropriate site to include for homogenising Bourke’s records? 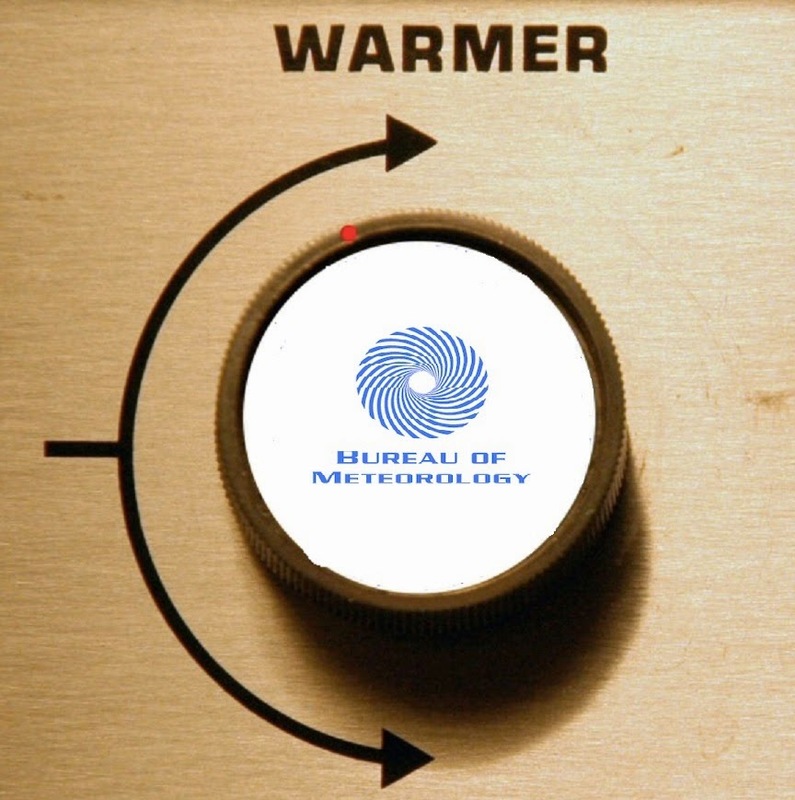 As a member of the World Meteorological Organisation, the BoM is inevitably caught up in global warming politics. After all it was the WMO that part established the Intergovernmental Panel on Climate Change and it remains an anthropogenic warming propagandist. The BoM is a large and expensive agency, employing 1700 people and costing more than $300 million a year to run. The importance of its database and the reliability of its forecasts go well beyond direct operating costs and daily bulletins. As the bureau says, 10 per cent of Australia’s GDP is weather sensitive. This makes its input to public policy potentially valuable. But it must first dispel suspicions of a warming bias. The memory of Climategate and its casual approach to celsius conversion, lingers. It should explain why homogenisation consistently turns cooling trends to warming and why pre-1910 records were dropped and, with them, the extreme heatwaves of the Federation drought. The record is error-ridden. Even to an amateur, the latest information dump prompts more questions than answers. The concerns about Rutherglen raised by Lloyd as to why a 0.35C cooling became a 1.73C warming still have no satisfactory explanation. No supporting documentary evidence, algorithms or methodology have been produced, leaving the unfortunate impression that temperature records were falsified. As Einstein warned, “Whoever is careless with the truth in small matters cannot be trusted with important matters.” Indeed, those who doubted the reliability of the “high quality” records that were abandoned for the 2011 ACORN-Sat data are unlikely to find much comfort in the latest release. But it’s not only temperatures where doubts exist. Lending its name to clearly partial scholarship only increases concerns that the bureau puts ­climate change advocacy ahead of scientific rigour and transparency. Trust in our national climate records is critical. Yet the more we see, the more we question. Now is not the time for a tame review.For the sake of public ­policy and the BoM’s reputation, the air must be cleared. Nothing short of a thorough government-funded review and audit, conducted by independent professionals, will do.